The Potawatomi Trail of Death recognizes the forced removal of the Potawatomi Indians from north central Indiana to eastern Kansas in the fall of 1838. The trail begins at the statue of Chief Menominee south of Plymouth, Indiana, extends east to west on Old Highway 24 running through Brunswick, Missouri, and ends at the St. Philippine Duchesne Memorial Park south of Osawatomie, Kansas. Missouri declared the Potawatomi Trail of Death a regional historic trail in 1996, following Indiana, Illinois, and Kansas. Throughout the state along Old Highway 24, Trail of Death markers have been located at campsites set up a one-day walk apart, every 15 to 20 miles. 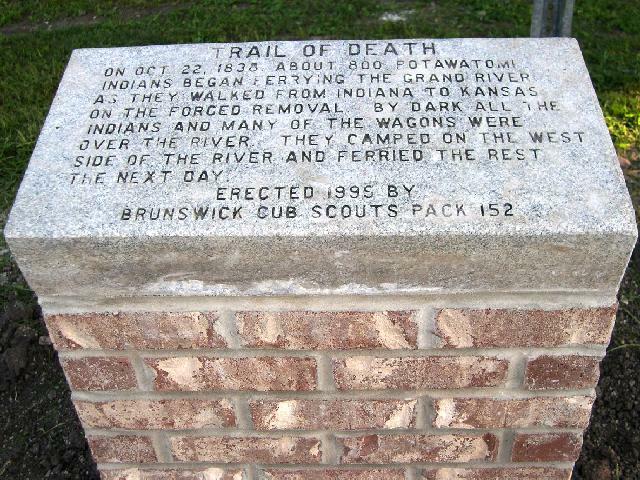 In Brunswick, the Potawatomi Trail of Death marker was erected by Cub Scout Pack 152 in 1999 at the Grand River Access, one block south of the downtown commercial district. Given flooding at the river access, local mason Roger White raised the marker with bricks in 2010 to place it above flood level.